Drops from Crawshuk the Hungry, at the top of a hill in The Haglands. Found north-west of the Highmountain flight point. Run up a snowy path and Crawshuk the hungry will be sitting there in a nest. Item Drops from that mob. 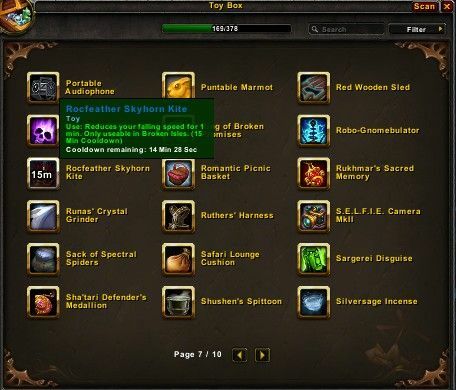 When combined with the other 3 items it creates Rocfeather Skyhorn Kite which functions exactly like Goblin Glider Kit Which is a controllable slow fall. Used to assemble Rocfeather Skyhorn Kite. A simple video I made on how to get this toy! You can find Crawshuk the Hungry, who drops this item, at 48.4, 40.0. The other coordinates posted are wrong. This item has a 15 minutes cooldown not 2 minutes like in the tooltip in the wowhead database. I uploaded a photo which you can see in the screenshot tab after it's aviable. Gleaming Roc Feather - it's one of 4 reagents, needed to create Rocfeather Skyhorn Kite toy. When you got all parts, combine it and there is Rocfeather Skyhorn Kite will appear in your bag. Does not work very well at the moment from Dalaran to Margoss's floating island. Half way there it just gave out and let me fall alllllll the way to the ocean. if you start in Skyhorn, go to the North, to the "Darkfeather Valley". If you reach the curve, go straight to the very small path uphill, there you will find Crawshuk the Hungry in his nest. Kill him to get Gleaming Roc Feather. The feather is not a 100% drop from Crawshuk. Some grinding may be required! Use: Combine a Gleaming Roc Feather, Delicate Roc Feather, Shimmering Roc Feather, and a Derelict Skyhorn Kite to repair the kite.